Copper slips from 1-week high? Is this a good time to go long in Copper? Confusing trend is back in base metals after a strong rally. It was seen that Copper along with other base metals were trading in green zone for a while. Most traders and analyst were quite bullish about base metals but lately prices have been trading in range. Today morning prices were capped as the International Monetary Fund (IMF) cut its global growth forecast and the trade tension between the United States and Europe seem to be growing. With global tensions aggravating, US dollar slipped effecting all metals. In past few weeks Copper along with other base metals recovered from the low due to supply deficit during this manufacturing season and positive numbers released by China. Despite production increase, there are supply deficits. With global tensions and reports from IMF, traders have been cautious and we can expect few profit booking sessions. A correction is expected but trend still remains positive. 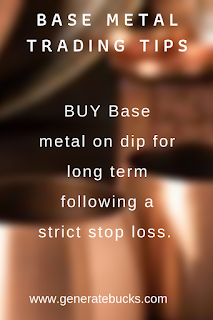 I would recommend buying base metals on any dips. Nickel – Short term traders could buy Nickel on dips since long term trend is bullish for Nickel. For long term positional traders, I would advise to wait till the prices touch 960. This would be a great price to create short positions. Aluminium – This counter is great for Intraday. Would recommend to short this to this week and make quick bucks.